NORTH ANDOVER, Mass. 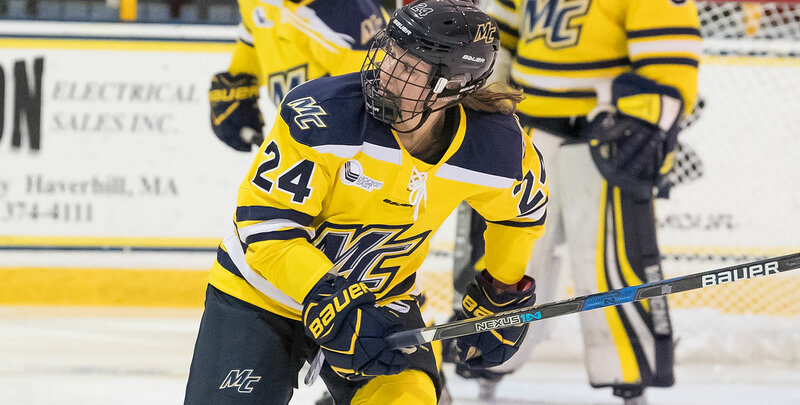 - The Merrimack College women's hockey team put on a shooting clinic Saturday afternoon, upending the HTI Stars 8-2 in its only exhibition game of the season. The Warriors outshot HTI 60-18 in the contest, with seven different Warriors scoring goals on the day. Goal #1 (1-0 MC) -Sophomore Kate Bukolska was able to feed senior Dominique Kremer just three minutes into the game; her one-time shot was redirected, easily getting across the line for the first goal of the afternoon. Goal #2 (2-0 MC) - Less than a minute later, freshman Gabby Jones got in on the action; senior Felila Manu was credited the apple on the first year's goal to make it 2-0. Goal #3 (3-0 MC) - Sophomore Megan Fergusson got in on the action halfway through the first period; after cutting through the left face-off circle, she was able to get a clean shot just outside the crease that rippled the net. Goal #4 (4-0 MC) - Senior Katelyn Rae was able to clean up a rebound with three minutes left on a power play; a great save from HTI netminder Katerina Zechovska bounced right to Rae, who finished the shot for the fourth goal of the game. Goal #5 (5-0 MC) - Courtney Maud finished off a shot with just over a minute left in the second period; senior Annie Boeckers was credited the assist to give the Warriors a 5-0 lead going into the break. Goal #6 (5-1 MC) - The Warriors finally gave up a shot on a beautiful shot from Natalie Mlynkova; a shot just over shoulder of junior netminder Lea-Kristine Demers put the Stars on the board. Goal #7 (6-1 MC) - Just seconds after conceding, the Warriors got back on the board; a clapper from senior Paige Sorensen from just inside the blue line ripped the net. Goal #8 (6-2 MC) - HTI got right back into the mix with a great single-handed effort from Valery Manchak; after weaving through a pair of Warriors defenders, she picked the top-left corner for the second score of the afternoon. Goal #8 (7-2 MC) - The Warriors got another on its third power play goal of the afternoon; Julia MacLean found the scoring column. Goal #9 (8-2 MC) - Maud got her second of the night with less than four minutes left to play; senior Annie Boeckers got her second apple of the night to finalize the scoring at 8-2. - This is the first-ever meeting between both teams. - Merrimack fired off more shots in the first two periods than they have any other game (40). - For the second straight game, the Warriors have had at least one power play goal, going three-for-five on the afternoon. Merrimack is back to Hockey East play next weekend, traveling to Durham, New Hampshire, to take on UNH. Puck drop is set for 7 p.m.